I hope your Wednesday (Wednesday? *checks clock*) is going well. A friend passed some Hunter S. Thompson material my way, and I would like here to share it with you. Below is a piece by Maria Popova @ Brainpickings.org, some Letterman interviews, and finally a youtube playlist which features the excellent, excellent film (starring Bill Murray!) called Where the Buffalo Roam. Quite the remarkable person. 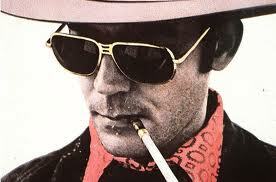 I really enjoyed the book Fear and Loathing in Las Vegas, but I feel that just about everyone has read it by now. If you`ve not, it`s an easy recommendation. This entry was posted in 2014, Uncategorized and tagged Fear and loathing in Las Vegas, How to Find Your Purpose and Live a Meaningful Life, Hunter S. Thompson, Where The Buffalo Roam. Bookmark the permalink.